If you already know about Hyakunin-isshu, please skip this page and go to the page of "Detailed rules of Kyogi Karuta". Rules in Japanese⇒Karuta Network　”HOW TO PLAY KARUTA"
日本語でのルール⇒　Karuta Network "HOW TO PLAY かるた"
Kyogi-Karuta is a game using the “Ogura Hyakunin-Isshu”*（小倉百人一首) Karuta cards. ＊Ogura Hyakunin-isshu is often called just "Hyakunin-Isshu (百人一首）". Ogura Hyakunin-Isshu is the name of the anthology of 100 poems selected by Fujiwara no Teika1162-1241）. All the poems in Hyakunin-Isshu are made in Tanka style, consisting of 31 syllables. The first half of a Tanka poem (17 syllables) is called Kamino-ku (上の句) and the second half (14 syllables) is called Shimono-ku (下の句). （Note: Some poems consist of 30 syllables or 32 syllables.） Two different types of Karuta cards are used for the game. One is the Yomi-fuda (reading cards読み札) and the other is the Tori-fuda (playing cards取り札). Each set has 100 cards. Yomi-fuda are used by the reciter (Dokushu 読手) and Tori-fuda are used for the players. 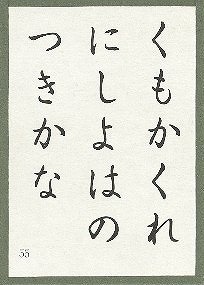 On Yomi-fuda, the whole poem is written. On Tori-fuda, only the second half of the poem is written in Hiragana. 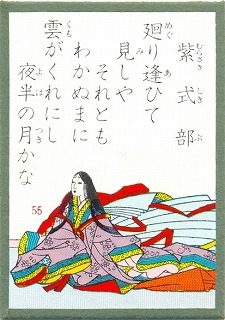 The principle of Kyogi-Karuta is to match the first half of the poem as it is recited (audio information) and the Tori-fuda. the author's name and portrait. the poem is written in Hiragana (Japanese phonics). The trickiest part of the game is that the reciter reads only the first half of the poem and the players take the card on which the only the second half of the poem is written.” Thus “ALL THE PLAYERS HAVE TO MEMORIZE ALL 100 POEMS”　to play the game. 1) There is a total of 100 Tori-fuda. Each player starts with 25 cards each in his/her territory (Jin 陣). The other 50 cards are not used for that game. The unused cards are called “Kafa-fuda 空札”. 3)The reciter uses the 100 Yomi-fuda for the game. Thus there is a 50% chance that the reciter will read a Kafa-fuda. If a player touches any card on the floor when a Kafa-fuda is read, it is a foul. 4) The winner is the player whose Jin is cleared (no card left) first. It means the winner is not “the player who took more cards” than the other. Even if you took more cards than your opponent, but committed a lot of fouls, you may loose. To know the detailed rules, please click here. Rules in Japanese 日本語でのルール⇒Karuta Network　”HOW TO PLAY KARUTA"
All Rights Reserved. Please contact karutastone@gmail.com to distribute or duplicate the contents in this website.